Well, it seems that the connection now wants to use SSLv3. And I don’t, so we have a bit of a conundrum. I did a search and found that enabling TLS resolves the issue. For more information on TLS check out this Wikipedia page on Transport Layer Security. Log onto your controller and check the tls options that are currently set. Once that change has been done test the connection once more and it should now appear successfully. 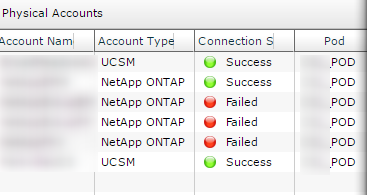 It seems that Cisco changed their authentication method slightly to NetApp storage as part of the 5.4 release. This entry was posted in Cisco and tagged Cisco Champion, Cisco UCS Director, NetApp, NetApp UCSD, SSL, UCSD. Bookmark the permalink.